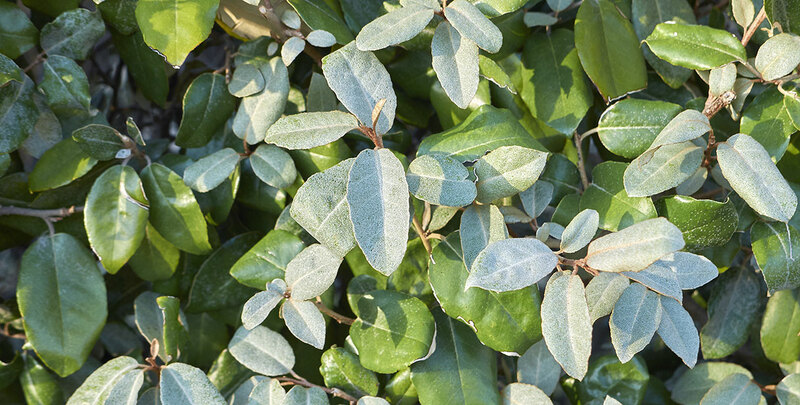 The oleaster or eleagnus x ebbingei in full, is an evergreen shrub particularly suited to those who are looking to create an astonishing border filled with flowers, berries and fragrance, providing year-round interest. Oleaster hedges are among the toughest around, as they can deal with dry, exposed seaside sites, where most other hedging plants would struggle to survive. This makes oleaster hedges a welcome addition to coastal gardens, because the number of plants that will thrive near the sea is relatively limited, as salty sprays and strong sea winds are potentially damaging to many plants. Wet or chalky positions, however, are not favourable and it prefers shade to full sun. Oleaster hedges are very hardy and will even tolerate cold winter winds. What really makes oleaster hedges stand out from the rest of the crowd are the small, silver-orange berries that appear as early as spring rather than during the autumn. And vice versa, the fragrant, bell-shaped, creamy white flowers are produced in the autumn. The berries are technically edible, but they are not particularly tasty, so most people just leave them on the shrub for the birds to find and enjoy. The oval-shaped leaves have a dark green colour and grey green undersides, which become visible when the wind blows against the leaves. 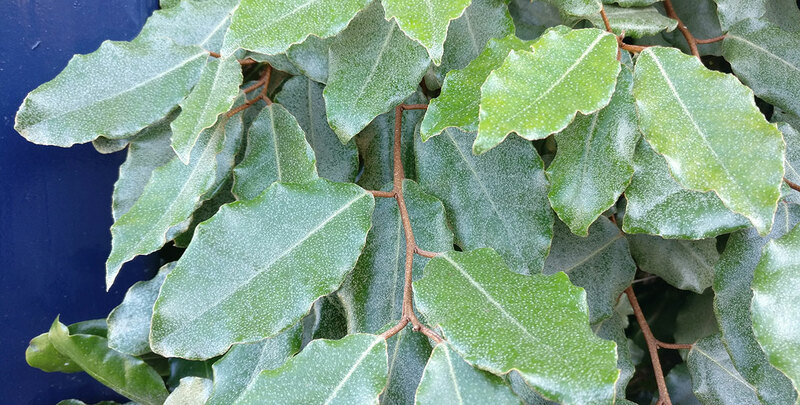 This is a display of colours that is fairly atypical for an evergreen hedge plant; oleaster hedges offer a combination of the healthy, green winter colour of an evergreen with the seasonal changes that are more commonly found in deciduous plants. The hybrid eleagnus x ebbingei is far from the only oleaster species around. There are many different species, both evergreen and deciduous, most of which are native to the subtropical and temperate regions of Asia. Given its origin, it is hardly surprising that this particular hybrid is so resistant to coastal conditions, as it was first bred in the Dutch seaside city of The Hague in 1929 by crossing a broad-leaved oleaster (eleagnus macrophylla) with a silverthorn (eleagnus pungens). Since the plant had to survive the conditions common to this city, which is located near the coast of the North Sea, it was essential that this hybrid would be very tolerant of wind and salty soils. Oleaster hedges are even very resistant to pollution, which makes them ideal for urban environments. Oleaster hedges can reach a height of about 1.80 metres and therefore, they will not provide total privacy, despite their relatively dense growth. They will grow large enough to serve as a windbreak, however, and anyone who has ever seen its brilliant green leaves or smelled the pleasant fragrance of its creamy white flowers will confirm that the oleaster is simply an excellent hedge plant that will add a unique elegance to any garden. While its berries are more appealing to birds than humans, they are frequently used to enrich the flavour of a sweet jams or sauces. Oleaster hedges are not generally planted for these fruits, however. The species is rather appreciated for its remarkable strength and ornamental value. Oleaster hedges are quite fast-growing and easy to grow, provided that both the soil and position meet the requirements as set out above. This species has a high tolerance of poor soils and retains nutrients in its roots, which allows it to thrive in a soil where nothing else will grow without adding fertiliser. Particularly harsh frost is potentially damaging to an oleaster hedge, but given the fact that these hedges are often planted in coastal regions, where climates are generally relatively mild, this should not be much of a problem. It may take some time before an oleaster hedge has grown dense enough, but once it has, you be able to enjoy the elegant green look of your hedge for a long time to come. In order to keep your oleaster hedge in check, it should be trimmed to shape once a year, preferably during the autumn. In case there are any diseased, dead or otherwise damaged shoots, these should be removed in mid-spring. Luckily, it does not take much effort to prune an oleaster hedge, which makes it a very rewarding, low maintenance hedge plant. 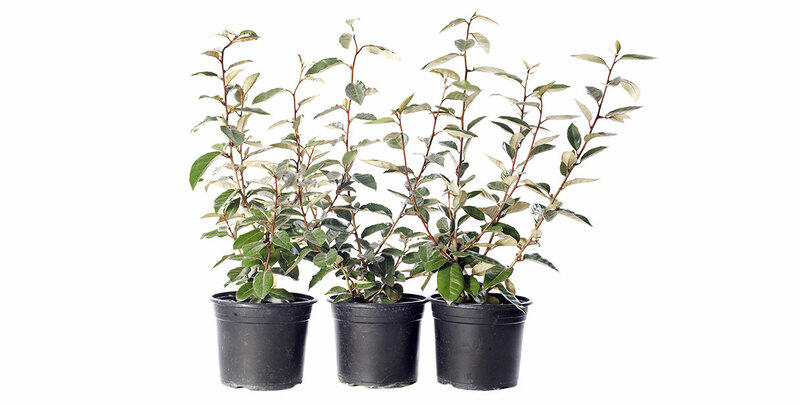 While an oleaster hedge will look great by itself, it is also possible to combine this eleagnus species with other hedging plants to create a patchwork effect and moreover, to enjoy the complementary effect of having flowers in your garden when your oleaster produces berries and vice versa. With a mixed hedge like this, your garden will be lively and colourful throughout the entire year. Why Choose an Oleaster Hedge? For those who live near the seaside, hedging options are often limited. Many traditional hedging plants are not very tolerant of salty soils and strong sea winds, and are therefore unfit to plant in a garden near the sea. This is where the oleaster comes in: a tough, undemanding plant that will survive where other plants struggle to do so. Oleasters are exceptionally hardy and wind resistant, which also makes them excellent windbreaks. But their ornamental value should not be overlooked. They will add colour to your garden throughout the year and even have a different look for every season, which is generally a feature of deciduous trees. Therefore, oleaster hedges are truly the best of both worlds. Strength, beauty and versatility, as well as the healthy winter look of an evergreen and the seasonal changes of a deciduous plant. It is often said that you cannot have it all, but an oleaster hedge is living proof that it is in fact possible.